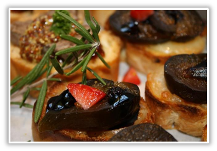 Established in 2011 by owner Melinda van Niekerk, Delightful Delicious Catering has proudly been serving the catering needs of private and corporate clients in the greater Pretoria and Centurion areas. We believe that food should look as good as it tastes. We only use the freshest and best quality ingredients in the preparation of our food and pay particular attention to the styling, presentation and plate decoration of our food. 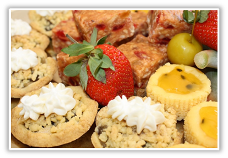 Delightful Delicious Catering provides a complete catering solution to our clients from the preparation of the food to the rental of the crockery, cutlery, glassware and table linen. We can also provide the rental of tables and chairs should that be required. We also offer an on-site waiting service for your function, the rental of a full bar service facility, advice on the paring and the provision of appropriate wines as well as assistance, advice and/or the actual implementation of all your function flower arrangement requirements. 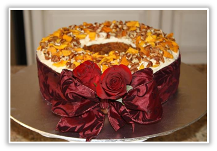 Delightful Delicious Catering has readymade catering options available under the Menu section on this website but can also tailor our catering solutions, suggestions and proposals based on our clients’ needs and function requirements. All our food gets presented and plated on large over-sized white ceramic platters, glass ware, decorative stainless steel as well as pewter ware where appropriate. When it comes to food, the taste there off and its presentation our passion for all things delicious and beautiful shines through whatever it is we cater for.